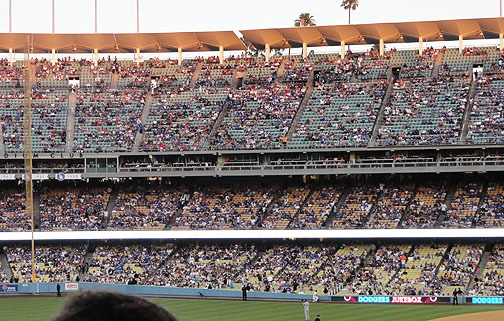 After holding the best record in major league baseball for most of the season, the Los Angeles Dodgers went into a serious slump, losing eleven of their last twelve games, five of them by shutout. 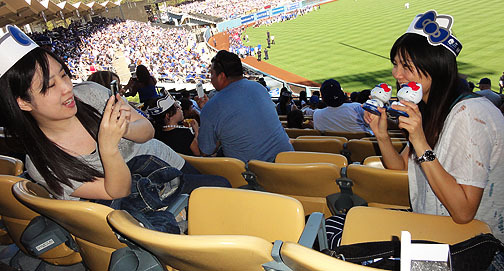 Dodger fans fretted day and night. But, on Sunday, July 1, all that changed. 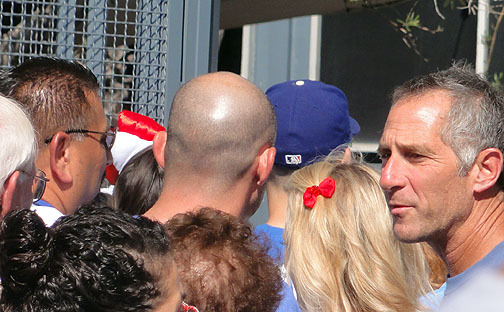 After Dodger management handed out free Hello Kitty Bobbleheads to the sellout crowd, the Dodger players exploded with eight scrappy runs, and trounced the New York Mets, 8 to 3. 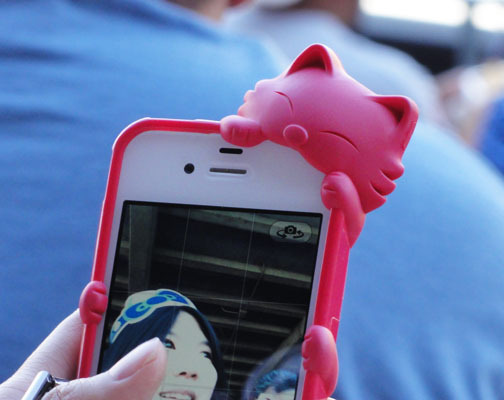 It was Hello Kitty power at its finest. Bo-Gay, Bruce, Martha, and I walked from our house to the stadium with Hello Kitty fan and great neighbor, Sakae, to that game to collect our bobbleheads. Here we are at the gates of the stadium. Can you spot the telltale Hello Kitty motifs? A panorama view from our right field seats. Dodger stadium is a handsome place. 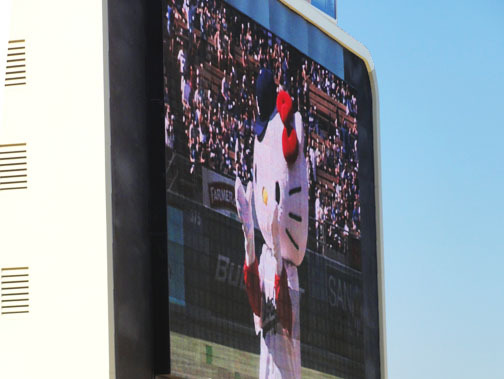 Hello Kitty beamed down upon us from the center field jumbotron. 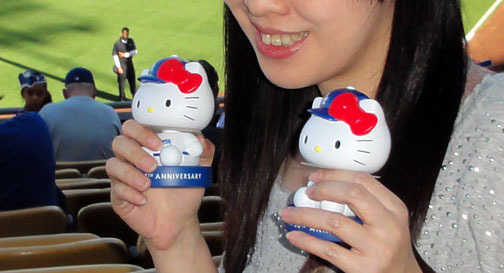 Two Dodger fans enjoy their Hello Kitty Bobbleheads. 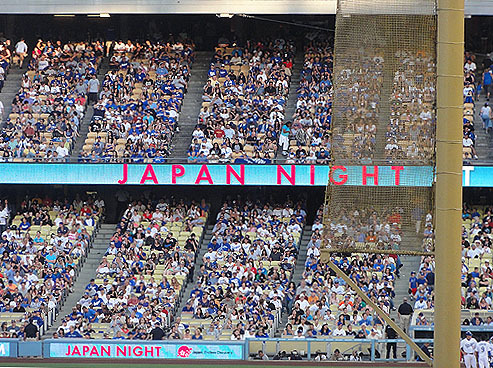 Sunday was also Japan Day at the stadium. Here’s a close up of the well crafted bobbleheads. Someone remarked that they looked so good because Hello Kitty already has a huge head! The cat theme was in evidence everywhere. This person was watching the Nisei Week queen and her court being introduced at home plate. Hello Kitty with the Nisei court at home plate. 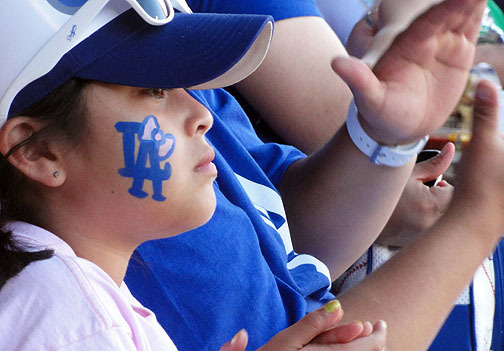 A young Hello Kitty Dodger fan with a nicely improvised decoration. The Hello Kitty motif was everywhere! Here it is! The Dodgers’ first run in many days as a batter gets a base hit and heads to first, and a teammate scores from second base. 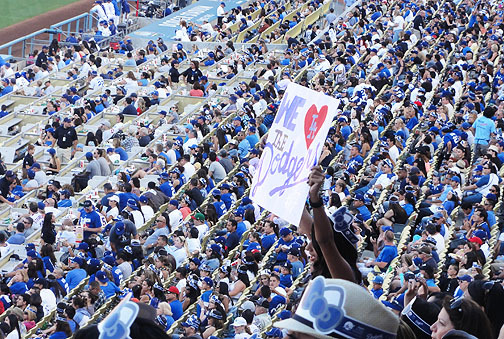 The crowd went crazy when the Dodgers finally scored a run! 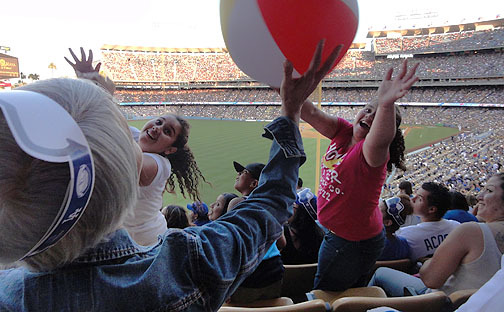 Of course, most kids came for the bobbleheads, so for the rest of the game they entertained themselves with bouncing beach balls all over the stadium. Beautiful colors pop up at dusk in LA! Hello Kitty’s parting shot, as a fan leaves after the game. 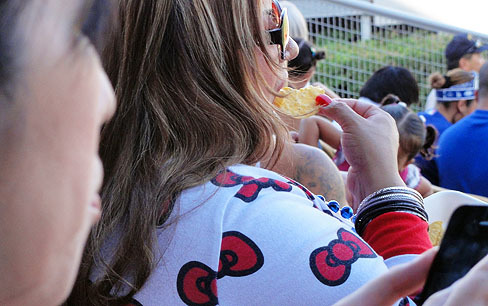 The next night, without Hello Kitty power in the stands, the Dodgers lost again. This entry was posted in Uncategorized by weisblog1. Bookmark the permalink.